Gone are the days of baking cookies or making crafts together. Although going out together for ice cream never goes out of style. My grandchildren are now 16 to 36. It’s not something to lament. As they get older their minds grow and their world of ideas expands exponentially. I love talking to them about their school or their work to try to understand empathically what their world is like. There are two topics lately that are on my mind because of their profound impact on the world of my grandchildren. From the news: Guns violence in schools. From a recent course I attended at Northwestern University: Media and Human Development. Both are foreign to me and my world, but I want to understand them to know my grandchildren. On the former, gun violence in schools, I have connected with the Deerfield/Highland Park Chapter of Moms Demand Action. Next week I’ve invited all of the residents in my condominium complex to come to a meeting to hear them speak about sensible changes to gun legislation that can promote gun safety. I hope to get others to join the new Grandparent Unit that we are creating. Moms Demand Action is open to all, and has supporters who are Democrat and Republican, Veterans, those who own guns and those who do not. Then, last week, I attended a lecture by Alexis Lauricella, one of a series in a communications course I am attending at Northwestern University. Dr. Lauricella’s research “examines the impact of media technology on children and adolescents with a focus on the educational potential of media experiences.” Anyone who knows me knows, just hearing someone speak is never enough. I want to understand the implications for grandchildren today. 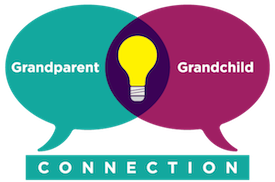 So…I have a meeting with Dr. Lauricella in the coming weeks to see how we can collaborate to help grandparents understand the technological world of their grandchildren. Grandchildren born today, like my great-grandchild, who is under two years old, will never know a time before technology. Artificial Intelligence and Augmented Reality will be his vernacular. I want to help grandparents to enter their grandchildren’s world. To see it. Feel it. Understand it. So that they can always be a part of it. Was I Naïve to not Believe in Hate?